The Muon g-2 ring sits on a small patch of concrete cleared of snow by the Test Beam Facility. Once the MC-1 Building is complete, the ring will have a new indoor home. Fermilab Today periodically runs updates on the construction of the MC-1 Building. 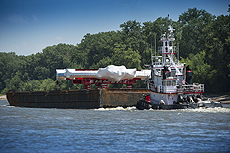 On June 22, 2013, a 50-foot-wide electromagnet ring departed Brookhaven National Laboratory, located near Long Island, NY, to make a sea-and-land journey to Fermilab in Batavia, Ill. Check out the 36-picture photo gallery. Secure on its flatbed truck, the Muon g-2 ring will begin the last leg of its journey over land to Fermilab this week. 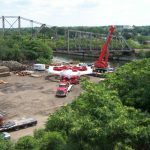 A crane lowered the ring onto a flatbed truck on Saturday in Lemont, Ill.
On Friday afternoon, the Muon g-2 ring passed near Pekin, Ill., close to the Kingston Mine. 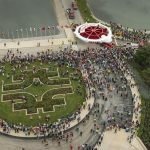 For the past month, a 50-foot-wide circular electromagnet has been on a fantastic journey between two U.S. Department of Energy national labs: Brookhaven National Laboratory in New York and Fermi National Accelerator Laboratory in Illinois. On Friday, July 26, that voyage is expected to conclude. Fermilab is planning a party to celebrate the ring’s safe arrival, and everyone’s invited. Plan for Fermilab’s Muon Campus. 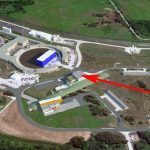 The arrow points to the MC-1 building, future site of the Muon g-2 ring. The Muon g-2 collaboration stands over the site where the g-2 ring will be located.